Soybean is one of the most important food crops around the world. 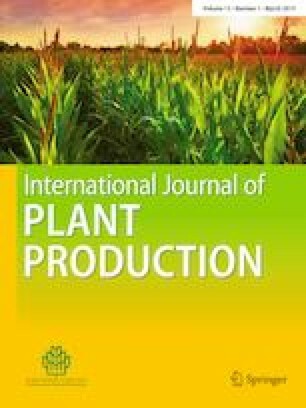 Despite its economic importance, the effect of sowing date and climatic conditions on soybean development and productivity of grain and oil has not yet been studied in detail. Such a study can yield valuable information regarding the interaction of this crop with its environment. In this context, the aim of this study was to estimate the soybean potential productivity of grains and oil for eight sowing dates, using historical series of climate data from Piracicaba (SP), Brazil. For this a stochastic model is proposed, with truncated normal distribution for maximum, minimum and average temperature data. The information generated in this study is important in order to provide farmers with relevant information about the importance of an adequate sowing date, as well as to further understand of the influence of the climate variations on soybean production. The September 1 sowing date, without lack of water, provides more adequate conditions for accumulated dry matter, grain and oil productivity. It was concluded that: (i) the stochastic model (Potential and Depleted Model for Soybean Grain and Oil Production) can be used as a valuable tool for analyzing variability and complex interactions between plants and climate conditions. In this model, the air temperature and global radiation parameters were adequate to estimate the duration of the crop cycle, dry matter production, photoassimilates partition, and grain and oil productivity of soybean plants grown in different sowing dates in Piracicaba–SP; (ii) considering the historical data of air temperature, global radiation and other optimal ecophysiological needs for the crop, the model results define September as best period for sowing soybean in Piracicaba (SP), Brazil. Marcelo Rodrigues Alambert and Renan Caldas Umburanas contributed equally to this work. We acknowledge funding from the São Paulo Research Foundation (FAPESP)—Grant no. 2016/06310-0 and 2017/24059-5 and thank financial support from Coordination for the Improvement of Higher Education Personnel (CAPES) and from National Counsel of Technological and Scientific Development (CNPq)—Grant no. 140209/2015-8). CONAB. Companhia Nacional de Abastecimento. (2017). Acompanhamento da safra brasileira de grãos. 2016/2017. http://www.conab.gov.br/OlalaCMS/uploads/arquivos/16_12_22_12_08_27_boletim_graos_dezembro_2016.pdf. Accessed 15 Jan 2018. Embrapa. Empresa Brasileira de Pesquisa Agropecuária. (2007). Instalação da lavoura de soja: época, cultivares, espaçamento e população de plantas. CNPSO–Centro Nacional de Pesquisa de Soja. http://www.cnpso.embrapa.br/download/cirtec/circtec51.pdf. Accessed 30 Jan 2018. FAO. (2019). Crops and livestock products. http://www.fao.org/faostat/en/#data/TP . Accessed 5 Feb 2019.